Cameroonian born but US-based Danielle Mingana Frankie Fochive, 21, will challenge 16 African beauty queens resident in the USA in this year's Miss AfricaUSA Scholarship Pageant. 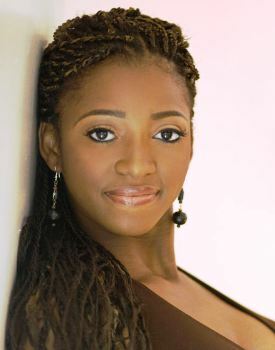 The Miss AfricaUSA Scholarship Pageant 2008, to be hosted at the beautiful Clayton Performing Arts Center, Saturday, November 1, is the idea of Cameroonian-born entertainer, resident in the USA, Lady Kate Njeuma. This year's event is being supported by Cameroon's Ministry of Culture, amongst other top-flight organisations.Expected to grace the 2008 Miss AfricaUSA Scholarship Pageant, with their maiden performance in the USA, is the Cameroon National Ballet. This entertainment band is professionally choreographed to represent Cameroon's rich and diverse cultures on the international scene. The band has travelled to most parts of the world, accompanying the Cameroon national football team and other Cameroonian heroes, when they represent Cameroon internationally. The Cameroon National Ballet was last spotted in China at the Olympics, with the most colourful display in the Parade of Nations during the kick-off of the Olympic Games 2008. The band will be sponsored by Cameroon's Ministry of Culture to provide great entertainment for the 4th grand annual Miss AfricaUSA Scholarship Pageant.Born in Cameroon on April 25, 1987, Danielle Fochive spent a few years in Paris, France, before relocating to the USA at 14, in quest of better education and to give a push to her dream career - modelling. A graduate from Albert Einstein High School in Montgomery County, Maryland, Fochive will subsequently gain admission into Montgomery College in Takoma Park, Maryland, where she is, currently, studying Optometry and Radiology. This granddaughter of late Jean Fochive, one time Cameroon Delegate of National Security, has always been involved with charity organisations, volunteering anything honourable to better the African continent. Thanks to her struggles in life, Fochive has had the dream to be given an opportunity to better the African continent to the best of her abilities. So far, Fochive has been modelling for the Nalo Production and John Casablanca Agency, respectively.The other 16 contestants come from; Burundi, Democratic Republic of Congo, Ethiopia, Gambia, Ghana, Guinea-Conakry, Kenya, Liberia, Nigeria, Senegal, Sierra Leone, South Africa, South Sudan, Uganda, Zambia and Zimbabwe. Is this Fochive not the daughter of the crook and embezzler of cameroon funds??? If so this is a sad story and culprits should be tracked down made to pay and disgraced. LONG LIVE A UNITED AND INDEPENDENT NORTH WEST CAMEROON!! Black beauty epitomised. Pretty, smart and articulate; a triple threat indeed. Self-hating black men who are so insecure about their skin color will rather prefer to go and marry white woman...some of them even marry those fat ones with excess meat overlapping all over the place. It's a shame! we say we love Africa, yet! we don't see the beauty in our own women. We would prefer to marry white women so that we can have "mixed" children with "light" skin and "curly" hair. Inferiority complex is killing some of you IDIOTS. Insecurity and inferiority. I really admire your compassionate love for the black skin and the reflection you see in black women. But this has totally blindsided you from the fundamental concept underlining marriage. Don't be surprise that the African culture you seem to proliferate is much cherished by the white man. Can you really explain to me why a black man will connive, steal the most valuable sculpture in whole of Bikom land (Afua-Kom) and sell to a white man?. Most of the teachings of how to cherish and preserve the African culture were thought to us by whites. In almost all art exhibitions I have been to, the paintings and works of art portraying African culture are highly valued by whites. (Diamond ring in a pig’s nose). Back to the issue of marriage, it is but normal for every black to cherish and be proud of the black skin and to see a reflection in a black woman. But the whole concept and principles underlining the search for a soul-mate has nothing to do with the colour of the skin. It is often said, for a 50 year engagement between a man and a woman, it is better to spend 40 years searching for the right soul-mate and live happily for 10 years than to spend 10 years searching for a soul-mate and live unhappily for 40 years. That's if you survive the 40 years. No amount of love for the black skin will make me prefer the latter to the former. Circumstances in life warrant humans to ask for help, some times life saving, from others. This circumstances usually ignite chemistry and flow of affection between people, be them white or black or any permutation you so desire. USA, these life saving situations are not provided only by blacks. USA, while a still admire your love for the black skin, don't make the mistake of considering it to be a limiting factor for marital choices. Reason being, you may risk spending a chunk of your life in marital penury because of your love for the black skin. I will not even waste a second of my time to argue with someone who makes comments like these. We are clearly not on the same level. Come back in five years. "We are clearly not on the same level. Come back in five years." USA, What Level are you? And how long did it take you to get there? From 10,000 fit, I know the personalities that can make such callous statements and that says quite much about you. That gospel truth is too bitter for any black man to even wave it a thought. Talk less of shallow mind. I don't expect you to respond. ...I said five years not 30 minutes. "Self-hating black men who are so insecure about their skin color will rather prefer to go and marry white woman..."
And you claim to be intelligent? that has got to be the dumbest statement of the week and it is only Monday morning. nihilism01, I know you married a white woman to secure "dokis" so I don't expect you to understand. Run along now, go back to you fat white mistress.